The easiest way to simplify this is to not give any gifts. But we may feel like that’s not really an option. Buying gifts should be done from the heart. If you do not enjoy giving gifts or cannot afford gifts for extended family, then it’s definitely time to reevaluate what is going on. One suggestion is to unite the extended family in a charitable venture like donating money toward animals or a freshwater well in an impoverished area. In this way, everyone gives what they can and is still part of something special. 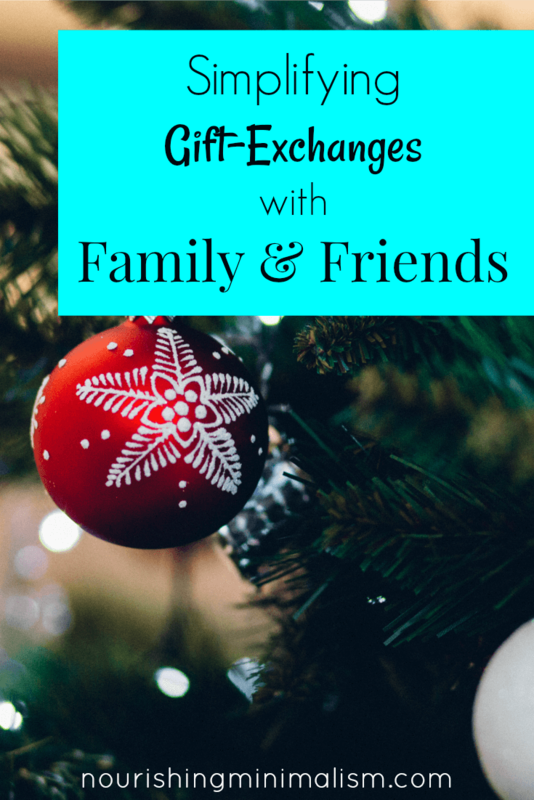 If you have a large extended family — like I do, (there are about 40 us) — a name exchange is a great way to shorten the gift list. If you feel comfortable with it, you can also make a charitable donation on behalf of family members. Imagine the simplicity: hop online, pick out of a gift, enter in your payment info, type in the name of the person you’re giving in honor of, and ta-da! Christmas shopping is done. What if they don’t want to simplify the gift-giving? If there are people in your life whose love language is gifts, suggesting that you not exchange gifts may make them feel unloved and rejected. Regardless of the frustration, please don’t allow the gift exchanges to drive a wedge between family members. Hey, we’re changing the focus of our Christmas and I’m determined not to be out shopping during all my free time, as I have in the past. I would prefer not to exchange gifts this year. I would love to meet you for coffee instead and catch up. Can we schedule a time in January? Most friends would welcome such a call. One of the consumption standards we’ve internalized — thanks to very clever marketing — is “Christmas is about the gifts given.” This idea has permeated our lives to such a degree that no matter our financial situation, we still feel the need to perform to that standard. And every over-the-top holiday is a non-stop advertising to our children that this is normal. This is how we shop, this is how we spend, this is how we consume. We’ve taught our children — at the marketers’ behest — that gross materialism is normal. Much of the busyness of the season is the mad rush to buy, buy, buy! Sometimes we’re shopping months in advance as well as binge-shopping on Black Friday. And for what? In 15 frenzied minutes on Christmas morning, people rip open boxes and bags only to forget about it by the following day. When did we start putting more effort into the buying and less into the actual giving? Which brings us to an important “why” — why we have been compelled to accumulate in excess, and why we’re struggling so hard to declutter and simplify our lives. And why we — you and I and people around the world — must tell a new story, a true story. We simplify our lives so that we have time to devote to the things we value. When we declutter and remove unnecessary things from our schedule, it frees up time. So essentially, we are giving up consumerism and materialism and replacing it with relationships and the time it takes to build those relationships. We can change this story of materialism and consumption. It has to start somewhere. This year, it starts with you. Do you want to cut back on gifts because it has become a stressful chore? Then your “why” could be “I’m striving to make the holidays a joyous celebration.” In this case, you will focus on removing anything that prevents it from being a joyous celebration. 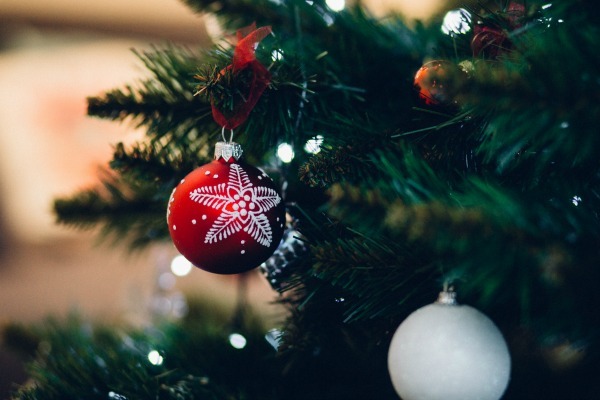 Are you simplifying the holidays because you’re sick of consumerism? In this case, your “why” could be “I’m striving to bring the focus back to the important parts of the holidays.” And you will probably focus on homemade gifts or activity gifts, acts of service, and religious rituals. Do you see entitlement in your children? Do you want to change the focus from self to a focus on kindness toward others? Your “why” could be “I want to share my abundance with others and find contentment in what I have.” In this case, limiting material gifts, decluttering possessions, and engaging in service would be your focus. Do you want to make sure your Christmas celebrates the birth of the Savior? Then your “why” could be “Christmas is the time to celebrate the Lord and all He has given.” Shed the materialistic influences and instead focus on Advent and the story of Christ so that all your traditions, or most of them, are centered in Jesus. You may not see a change from friends and extended family this year, but having the conversation is where change begins. I love simple holidays. We have a deal with the whole family that we will make/find (in nature)/ or repurpose (thrift store or re-gift) our presents to each other. But there is also an understanding that if we don’t have the time/money/our otherwise, that there are no hard feelings or expectations. We have a wonderful holiday and the kids know that the time with family is the focus. The kids love making presents too! We got the family on board a number of years ago by suggesting that we do a thrift store Christmas. Not everyone went for it at first, but it started to shift the focus, and now it’s a completely no pressure Christmas. I can easily downsize my wardrobe to half a dozen tops, a couple bottoms, a couple cardigans, 3 pairs of shoes, and a dress for special occasions. My mother is a very controlling person though, and a worry wart. If I don’t wear something different every time she sees me she gets upset. I should try to explain minimalism to her, but she may not get it and will insist on getting me new things. From my point of view, people with a lot of clothes should give to people who honestly need them. Keeping more than I need just to please my overly concerned and interfering relatives seems silly if not selfish. As a childless single, I don’t need to take unwilling children or a spouse into consideration, but my family of origin is proving difficult to handle as I inch into a minimalist lifestyle. I l9ve this! Thank you for writing yhis. Oops that’s what I get for typing on my phone while nursing, haha. * love this * it is supposed to say. It’s spot on and gives me ideas for how to respond. My family is slowly making the change but we are trying! This is the first Christmas we are focusing around memories and family time instead of things. I enjoy reading your tips on minimizing AS it encourages me on my continued journey. I love the idea of we pushing back on the marketing and telling the truth that Less is better. I am very slow to get the minimalist, but it is because of growing up in an out of the way place, where getting things was hard. We usually had to use what we had, ad so save things, “in case we needed them.” We weren’t poor, but we had lots and lots of space for saving things to use, instead of the thing we needed. I realized years ago that something had to change, we move a lot and dragging “i might needs” around is not working. We cut back, purged, got rid of, but still excess gets in. I try to have places for things, But on Christmas morning, I still dread the “where does this new thing live.” Thrift stores are my best friend, I can donate what I don’t need and get the right thing. Doesn’t always work out perfectly, (and I am tempted to keep and buy, just in case) but I am working on letting it be imperfect. More stuff just takes more time. Time is more important to spend on my loved ones than on my stuff! Thanks a bazllion (not minimalist I know), for this article, the affirmation, and the words to use when communicating intentions with others. My goal is to continue to move away from mindless consumerism and move toward deeper, more fulfilling choices and living in life! My sisters and I (4 of us) who live 100 miles apart once had a “potlatch” Christmas Party. We met at a restaurant in a central location and each brought a box of things we were getting rid of. then we enjoyed a meal together and looked at each others discarded stuff. If you wanted anything you could take it, or take nothing if you did not. afterward we donated the left over items. It was fun, and helped us with our minimalization efforts–bring lots of stuff, take home one item. Hope you like this idea!